At Australian Professional Electrical Services we provide a comprehensive range of commercial electrical services, which cover your business’s needs. We work with small and medium sized businesses in and around Adelaide, delivering a fast and efficient commercial service. For your safety, our work is performed in accordance with strict current Australian safety standards. 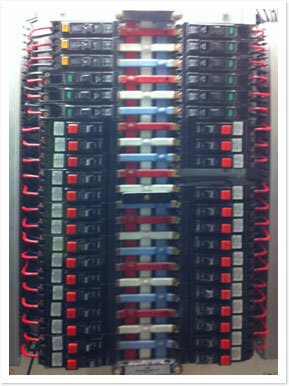 Our team of commercial electricians is fully licensed and accredited for your peace of mind. Each of our electricians is hand picked based upon their experience and knowledge. To ensure their technical ability is up to scratch, they undertake regular development training. We believe training is a crucial step to make sure electricians produce quality work, as well as to keep up with the latest industry standards and regulations. Our electricians have the ability to solve a range of commercial problems and will restore normal functioning back to your commercial property. Below is a list of some of the electrical services we offer. In addition to helping small and medium businesses, we also assist residential property mangers. If you are a residential property manager looking for residential or domestic services, please visit this page to see the range of services we can offer you: Domestic Electrical Services. If you would like to hire our commercial electricians for your Adelaide business, contact us today.